Nothing in the House: Tart of Gold Valentine's Day Party! 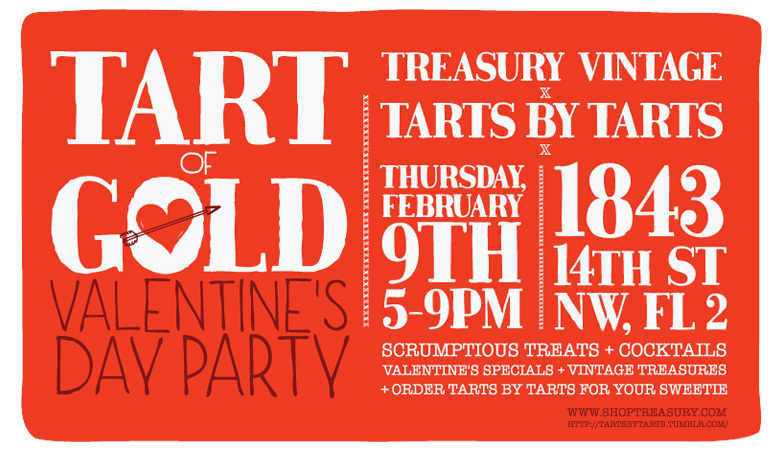 Tart of Gold Valentine's Day Party! We've got more where that came from! Part deux of the heart tarts in D.C. news is that Tarts by Tarts is teaming up with Treasury to bring you the Tart of Gold Valentine's Day Party! It's happening this Thursday from 5-9pm at Treasury, located at 1843 14th St. NW. We'll have treats aplenty--doughnuts and tartlets, cookies and caramels, delicious cocktails and vintage treasures! You can pick-up your ordered tart at the party, or order one for delivery on Sunday and we're also running a special cross promotion. When you order a tart from Tarts by Tarts, you'll receive 20% off one item at Treasury, and when you buy from Treasury, you'll receive $5 off of your tart! Now that's a pairing we can get down with. We've had so much excitement leading up to this event-- from planning with the lovely ladies of Treasury, our doughnut & vintage styled photoshoot, to recipe selection and promotion--we hope you can be a part of it. And look! We're been written up in Refinery29 and been called a "local baking supergroup!" Love at first bite, indeed!